Solgami is ideal for apartment-dwellers who don’t own their homes, and have no say in whether solar panels are installed on their roof, Fast Company reports. “We’re looking at repositioning the city as a place of production, not just a place of consumption,” said Ben Berwick, an architect with the design firm Prevalent, who’s working on a prototype with a manufacturer in Japan. 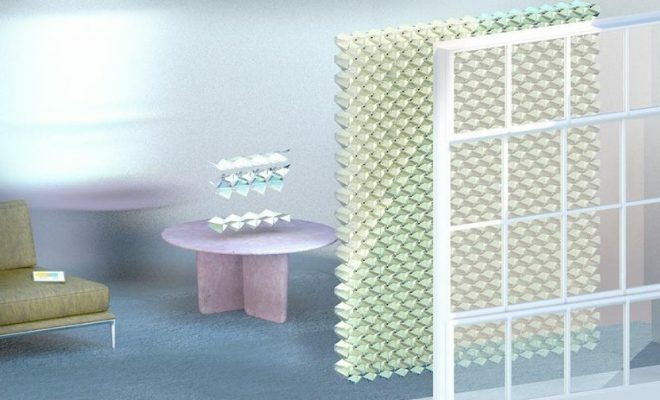 While the origami shape is tricky to design at the prototype stage, it’ll be “relatively simple to manufacture at scale” by screen printing thin-film solar cells onto a plastic backing, cutting out the design, then folding it into its final shape. Fast Company says the output from the units will depend on the size and orientation of the windows, among other factors, but while those details are still taking shape, Prevalent claims the blinds will supply all the electricity required to run a glass-walled office building. “This is basically a geometry to allow that to happen, considering the majority of the world’s population live in apartments or in urban areas,” Berwick said.